Once upon a time there was a beautiful mermaid and her name was Syrenka. She lived for hundreds of years off the coast of Massachusetts, enamored with numerous men through the years, until she met Ezra Doyle. Ezra was a naturalist and was excited about learning as much about sea life, its creatures and myths. In 1872 Ezra met Syrenka and they fell in love. Unfortunately their love was doomed because Ezra was human and could not survive living in the sea and Syrenka was a creature of the sea and could not live on land, or could she? Fast forward to present day and meet Hester Goodwin. Hester is a seventeen-year-old girl that has decided she can never fall in love, marry or have children. She arrives at this decision because her mother died shortly after her birth. Her grandmother died shortly after giving birth to her mother, and all evidence points to the same occurrence happening to all of the women in Hester's matrilineal ancestry going back to her great-great-great grandmother, Marijn Crotty. If this wasn't strange enough, Hester meets a young man named Ezra in a cave off of the beach one summer night. For some reason Hester and Ezra are pulled toward one another. As Hester tries to discover what may be causing the women in her family to die after giving birth, and always to a female child, she uncovers more and more strange information about her ancestors and their possible ties to strange and disastrous events in the past. As Hester continues to investigate, at the urging of her new friend Ezra, she virtually ignores her old friend, Peter Angeln. Ms. Fama has crafted a unique and ghostly love story that spans several hundred years. The mystery and suspense build throughout the story, and kept this reader eagerly turning each page to learn more about Syrenka, Ezra, Hester, Marijn, and Peter. Monstrous Beauty offers a little bit of everything: romance, touches of horror, mystery, suspense, murder, revenge, mythical creatures, a sea monster, and even ghosts. As a result of all of these elements, it is somewhat difficult to classify Monstrous Beauty, but I think that neo-gothic romance fits. Monstrous Beauty is a fast read that captured and held my attention from the first page until the very last. 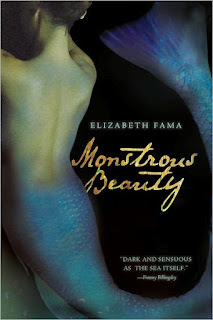 Although classified as a YA read, I believe that Monstrous Beauty is suitable for readers of any age. If you're looking for a great read, this is one you should definitely consider. Disclaimer: I received a copy of this book free for review purposes from the publisher through ShelfAwareness Pro. I was not paid, required or otherwise obligated to write a positive review. The opinions I have expressed are my own. I am disclosing this in accordance with the Federal Trade Commission's 16 CFR, Part 255: "Guides Concerning the Use of Endorsements and Testimonials in Advertising."